Today was ideal for being in the garden, even if the task at hand was to weed a long strip along the fence on the north side. It was sunny, temperatures in low sixties and peaceful—no mosquitoes, no air conditioners running yet and only one neighbor mowed his lawn. 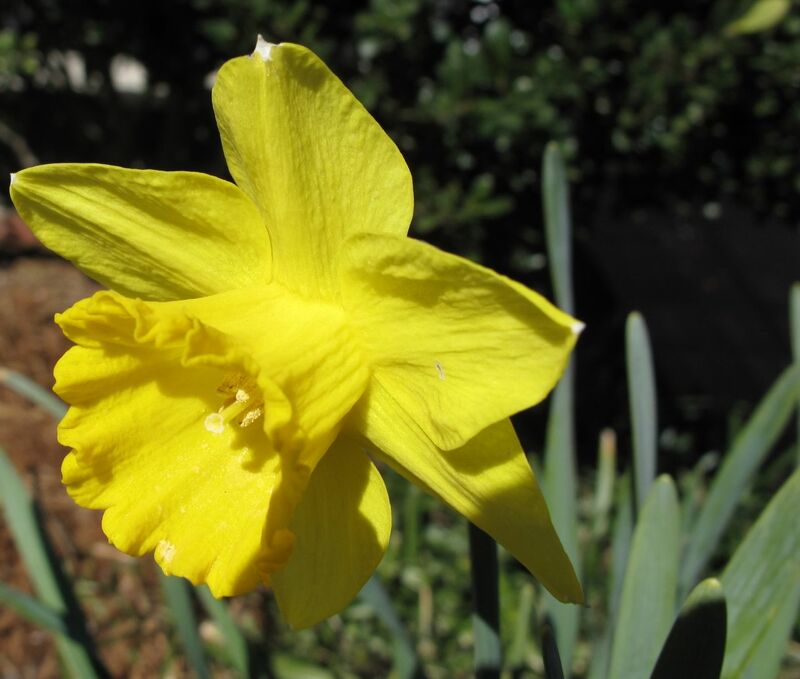 There is nothing new blooming at this time, but the daffodils continue to add brightness and cheer. 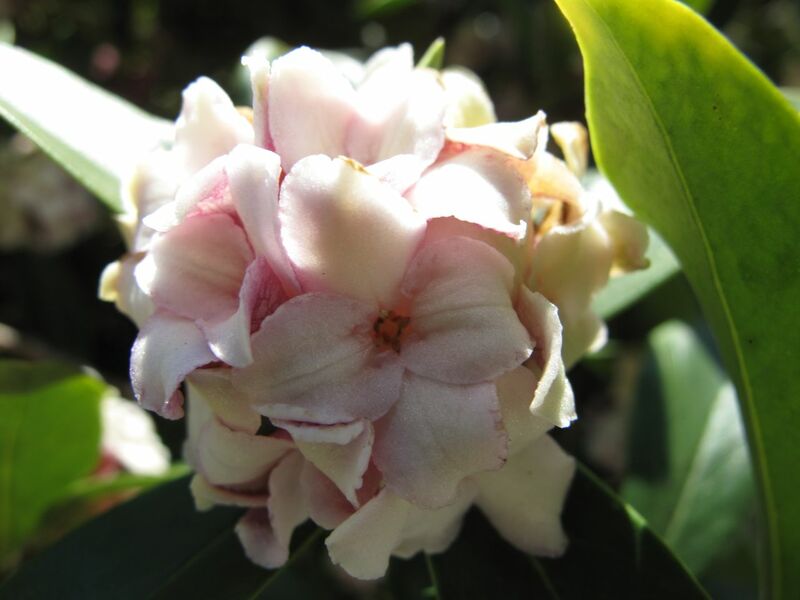 Recently there have been some very windy days, sending drifts of lemony fragrance around the yard from the Daphne odora (Winter daphne) The Winter daphne has been blooming for weeks. Most of the flowers are browned, damaged by cold weather, but the delicious scent lingers. Progress in pulling weeds today was slow as I have injured my left hand and doctor’s orders are to rest it and not lift more than a few pounds. The hand seems to be improving, but slowly. I could not waste the beautiful day so I weeded with the other hand. This was highly inefficient but it allowed me to enjoy being in the garden, thinking garden thoughts. One thing I contemplated is where are all the early spring plants I added last year? There is no sign that Mertensia virginica (Virginia Bluebell) will return—I think it should coming up by now. It was among a group of natives I added to the garden last March. From that group at least the three Rudbeckia fulgida (Orange Coneflower) and three Phlox divaricata (Eastern Blue Phlox) have survived. Others which I believe likely did not make it are Chrysogonum virginianum (Green and Gold), Geranium maculatum (Wild geranium), and Sanguinaria canadensis (Bloodroot). There is no sign either of Polemonium ‘Bressingham Purple’ (Jacob’s Ladder), which was crushed by a neighbor’s broken pine tree mid-summer. I hoped somehow it was tough enough to rebound. It is too early in the gardening season to be discouraged I think. Tomorrow should be another nice day for gardening. With plenty more weeds awaiting, there should be ample time to ponder the fate of these lost plants and to work out how to fill the void, yet again, left by their absence. Better still, perhaps the plants will turn up. This entry was posted in garden and tagged daffodil, Daphne odora, early spring plants, weeding, winter gardening on March 9, 2013 by pbmgarden. Aren’t daffodils such cheerful little flowers! I’d say not to worry on the plant front just yet – I have so often thought a plant hasn’t made it, and then suddenly there it is! I also console myself with the thought that some plants might just make it through the winter only to struggle all year if they’re not entirely happy. I do hope the plants are just finishing up a long winter nap. It has been colder this year too. Thanks Cathy! Don’t worry about your plants not showing, it’s early days yet. My polemonium are not showing either but I know they will soon when the weather gets a bit warmer and stays warmer! Your daffodils are so beautiful, they must make you smile every time you look at them! That’s reassuring Pauline. Last year they were blooming by Mar 20, so I was concerned not to see them coming up. Guess it really hasn’t been nearly as warm here this winter as it was last year when so many things bloomed early. Natives are slow to come especially the wildflowers…And if you just planted them they may take longer and will need a bit of time to grow and fill in (I have seen a coule of years sometimes). And of course the VA bluebells can be fussy to start. Hope they come back for you! Hi Donna. Thanks for this good info on the wildflowers. I didn’t know the bluebells were finicky to get started, but just was so enamored of them last year I decided to try them. I think the Bloodroot is one that might be very slow. I should have better marked where these were all planted last year. Take care. Lovely Daffodil. Hardly wait for mine to bloom, they are only an inch off the ground. Sorry to hear about your hand. I hope it’s healed soon….your garden needs you. 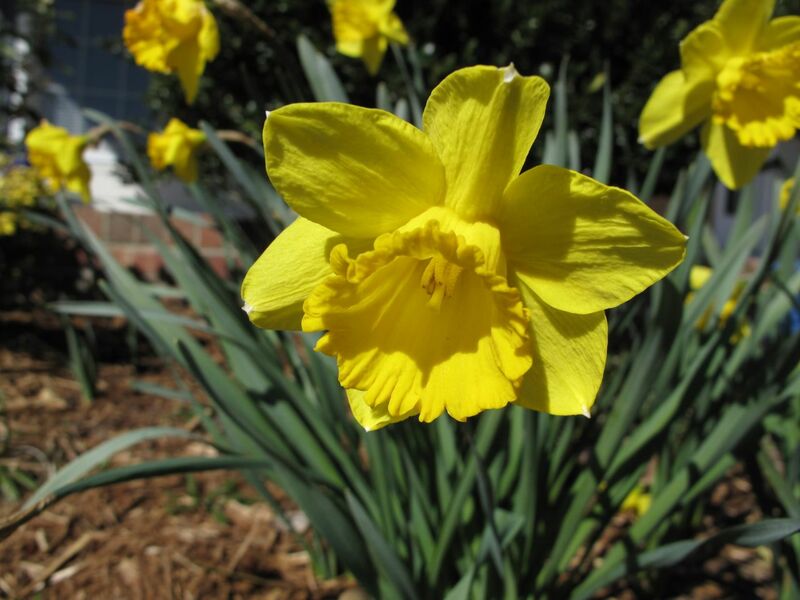 Nothing says spring cheer like a daffodil! I hope your hand is better soon. No time is a good time for an injury but weeding season is especially inconvenient. Thanks. The hand is mending slowly–much better than last week. Hope you’re doing well. Hi there pbmgarden, I picket this post because it makes me think of things to come here in upstate New York. I have chopped, raked and bagged 28 big brown bags of debris from the garden, and hope they are taken Friday which is garbage day. My cleaning has inspired my neighbors, so after cleaning up my land, I hope things from theirs properties don’t blow back in my direction. The funny thing is , I clean things up really good in the Fall, but there is always that Spring mess that has to be addressed. But in a way, the mess gives me a reason to be/work outside. Happy Spring to You!